Two of the works signed in pencil, lower right: W. Hekking and W. Hekking Fec. Born in Amsterdam in 1796, Willem Hekking was trained as a painter and draftsman by Anthonij van den Bosch. Following in the footsteps of his his father, he first started out decorating wallpaper. By 1793, he became a member of the Lukas Guild and mainly focused on producing land- and cityscapes, as well as drawings in ink and watercolour. 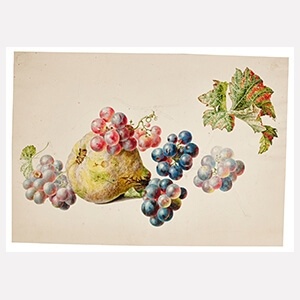 Between 1813 and 1838 Hekking is recorded of holding several exhibitions in Amsterdam and Rotterdam, where he mainly displayed still lifes of fruit and flowers. Marina Adriana Maria van Toulon, Anna Maria Veeren and his son Willem Hekking Jr. (1825-1904) are among his pupils.